Unconfirmed QuotationsIn his 1989 book Myth of Separation, WallBuilders’ founder David Barton argued that the Founding Fathers would be appalled by the government-enforced secularization of the public square that became widespread in the latter half of the twentieth-century. In the course of making his argument, he utilized a number of quotations from America’s Founders that he found in secondary sources on the subject. He carefully cited each quotation. However, he subsequently realized that some of the quotations he used for Myth of Separation came from sources other than original ones. Scholars and popular historians routinely utilize secondary sources or take quotations from these sources, 1 but when David returned to this subject for his 1996 book Original Intent, he decided to only rely on quotations that could be found in original primary source material. In an effort to be thoroughly transparent, he placed the handful of secondary quotations from Myth of Separation on an “Unconfirmed Quotations” list which he posted on WallBuilders’ website. At that time, he challenged writers on all sides of the debate over religion in the Founding Era to stop relying on secondary sources and quotations from later eras and instead to utilize original sources. As stated in the piece “Taking on the Critics,” David was not confronted by any individual or group about these quotes. To the contrary, he was the first to step forward and challenge all sides in the historical debate over religion in the Founding to “raise the bar” and use only quotations that could be verified by primary sources. Calling these unconfirmed quotes “bogus” implies that they were simply made up by David. Yet each and every one of them can be found in secondary sources, which David cited in his earlier works; and many academics, especially on the secularist side, continue to rely on secondary sources for their authorities. But Frazer and others suggest that David and WallBuilders live in a fantasy world where they stubbornly engage in wishful thinking that these unconfirmed quotations are accurate. However, Frazer ignores the fact that WallBuilders has been able to confirm some quotations on our original list. The now Confirmed Quotations are listed below, followed by those that remain unconfirmed in original documents. Original sources for these latter quotes may yet be found. After all, James Madison’s detached memoranda, much beloved by secularists, did not surface until 1946. And original letters and documents from Founders are still being discovered today in dusty archives, private estates, and other uncatalogued sources. Additionally, existing collections are still being digitized and regularly added to the web, thus steadily increasing the field of searchable materials for these unconfirmed quotes. While WallBuilders has now located original sources for several of the quotes (see below), we continue to recommend that individuals refrain from using those that still remain on the Unconfirmed list until such time that an original primary source may be found; or if using these quotes, clearly identify that they come from a secondary and not a primary source. This particular quote has been used in many works since the 1970s that seek to remind Americans of our religious heritage. 3 It originally appeared on WallBuilders’ “Unconfirmed” list, but we are now able to report that we have found an early primary source that attributes this message to Franklin. This is no insignificant source, for Bancroft is considered “The Father of American History.” He is most famous for his thorough, systematic history of the nation published in ten volumes from 1854-1878. Contrary to the claims of Gregg Frazer and other critics, David did not simply invent this quote. It appeared in one of the greatest histories of the United States ever written! But adhering to his own standards, David stopped using this quote until it could be confirmed in an original source. However, such a source was recently discovered. It may be objected that a second-hand account of what someone said is not as reliable as, say, a letter clearly penned by Franklin in which he writes the same quotation. We agree. And yet students of the American founding repeatedly utilize such sources. 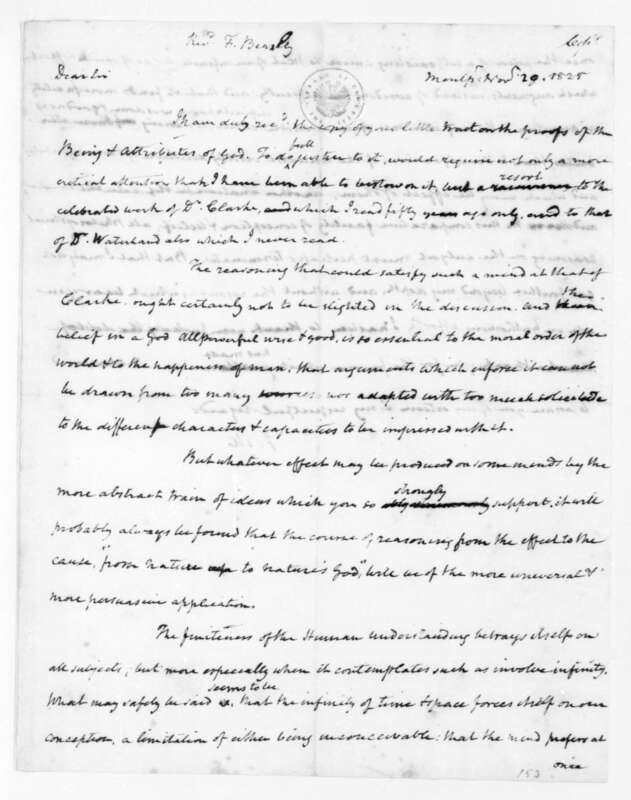 For instance, speeches made in the Federal Convention of 1787 are regularly quoted as if they were directly spoken by particular delegates, although in most (but not all) cases what is being quoted is James Madison’s notes of those speeches. Those who wish to deny America’s Christian heritage will undoubtedly brush off Du Pan’s account of Franklin’s views. Yet those interested in an accurate account of religion in the American Founding cannot afford to be so dismissive of this important find. This quote, also used in numerous modern works, 8 appears in an 1869 book edited by Samuel W. Bailey; 9 but because it did not appear in Jefferson’s works or writings, and because the occasion in which it might have been spoken by him could not be identified, it was left as unconfirmed. Its source, however, has now been found: the writings of the great Daniel Webster (1782-1852). Webster was part of the second generation of American statesmen. Born at the end of the American Revolution, he grew up with the speeches of Presidents George Washington, John Adams, Thomas Jefferson, and James Madison. Following his own entry into politics, he became a leading national figure, serving almost a decade in the U. S. House, nearly two decades in the U. S. Senate, and being Secretary of State for three different Presidents. So, while the quote is not found in Thomas Jefferson’s personal writings, it was recorded by a respected eye-witness. Because this quote fits well with Jefferson’s numerous attempts to promote the study of the Bible (thoroughly documented in The Jefferson Lies), it seems reasonable to attribute it to him. Initially, this quote was not found in any of Adams’ own writings; and it seemed unlikely that Thornton was reporting what Adams had personally told him, so we therefore placed it on the Unconfirmed list. We have now found the origin of this quote. 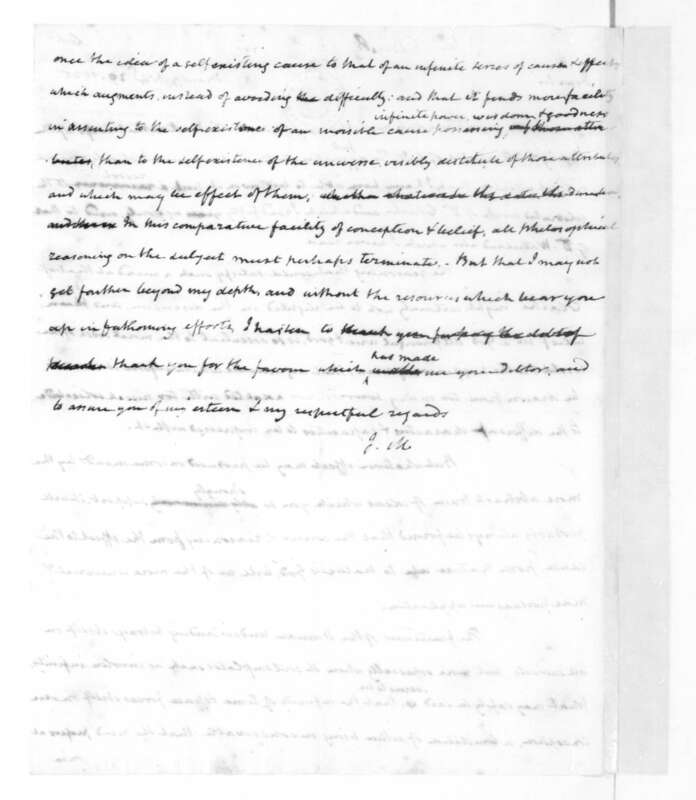 It turns out that Thornton had simply, but accurately, summarized an opening section from one of Adams’ famous published orations: his 1837 Fourth of July address at Newburyport, Massachusetts. Comparing Adams’ original 1837 quotation with Thornton’s 1860 summation of it, one immediately sees the origin of Thornton’s statement. He had accurately related the essence of Adams’ message; and while he never presented his statement as being an exact quotation from Adams, those who used Thornton’s work in subsequent generations assumed that it was. Consequently, this Unconfirmed Quotation originally attributed to Adams can now be replaced with his exact statement as delivered in his 1837 speech. This quotation, too, appeared in numerous modern works 15 and was identified as being a quote from the “Supreme Court.” Those who used the quote assumed that it was from the U. S. Supreme Court, but when searching the Court’s opinions, it was not found, even though it was consistent with the tone and rhetoric of the U. S. Supreme Court’s “Christian nation” decision in Church of the Holy Trinity v. United States (1892). 16 Not finding the quote in that case, the next thought was that it perhaps appeared in Supreme Court Justice David Brewer’s book subsequently written on the same subject after he had penned the language in the Court’s unanimous decision in the Holy Trinity case. While he definitely used phrases similar to this quotation, 17 it did not appear in his work. But after more than a decade of searching, this quote was finally found; and it definitely was from a ruling by a “Supreme Court” – the 1883 Illinois Supreme Court! 18 This quote is now authenticated and can be cited, providing that it is attributed to the proper court. This quote was found in multiple modern works about the Founding Fathers and the Founding Era. 19 But because it lacked primary source documentation, this statement was held as suspect. But eventually this exact quote was found in a letter from Samuel Adams to fellow patriot James Warren on February 12, 1779, 20 and thus it has been removed from the Unconfirmed list and placed it on the Confirmed list. Maxims of Washington: Political, Social, Moral, and Religious, John F. Schroeder, editor (New York: D. Appleton and Company, 1855). This work has been reprinted multiple times since 1855, including by The Mount Vernon Ladies Association in 1942. However, due to unwise editorial changes made by the modern editor, John Riley, in the most recent edition, the current version is considered unreliable. We therefore highly recommend older versions. William J. Johnson, George Washington The Christian (New York: The Abingdon Press, 1919; reprinted in 1976 by Mott Media, and in 1992 by Christian Liberty Press). There is certainly abundant evidence to support thesis of the quotation in question as generally consistent with Washington’s beliefs, although the exact wording of this quotation currently remains unconfirmed. This quote, which has been utilized in numerous works over recent decades; 28 seems to have first appeared in The Virginia magazine in 1956. 29 Few could dispute that this quotation is consistent with Henry’s life and character. There are many similar quotes; so while the specific statement above is currently unconfirmed, it is certainly consistent with the tone and rhetoric of other of Henry’s declarations about Christianity. civilization, not upon the power of government, far from it. upon the capacity of each and all of us to govern ourselves . . . This quotation, like the others in this list, has been used in numerous modern works as well as works dating back to 1939. 37 These words have not been found in any of Madison’s writings. However, the key thought of the necessity of individual self-government according to a Biblical standard is reflective of Madison’s expressed beliefs. Despite other quotations consistent with the emphasis of the one in question above, this specific quotation remains unconfirmed, and it should not be used unless it can be verified in an original primary source document. SummaryChristians, of all people, should be known for their honesty. In David’s early works on religion and the Founders, he used quotations that he had every reason to believe were accurate. When he began to have questions about the validity of a few of these quotations, he publically acknowledged that they may not be accurate. Since 1996 he has been able to confirm some of these quotations, and has ceased to use those that he has not been able to confirm. As the historical debates continue over the relation of church and state and the faith of the Founding Fathers, all involved should pursue the highest standard of scholarship. Anyone writing on this subject is encouraged to document their sources, and to always take quotations from primary rather than secondary sources. 2. From a hostile written review of David Barton and WallBuilders written by Gregg Frazer at the request of Jay Richards. That written critique was subsequently passed on to David Barton on August 13, 2012, by the Rev. James Robison, to whom Jay Richards had distributed it. 3. See, for example, Peter Marshall and David Manuel, The Light and the Glory (NJ: Fleming H. Revell Co., 1977), p. 370; Stephen McDowell, America’s Providential History (Charlottesville, VA: Providence Foundation, 1989), p. 1;William Federer, America’s God and Country: Encyclopedia of Quotations (Coppell, TX: Fame Publishing, Inc., 1994), p. 246; Martin H. Manser, Westminster Collection of Christian Quotations (Westminster: John Knox Press, 2001), p. 151; Classics of American Political and Constitutional Thought, Scott J. Hammond, Kevin R. Hardwick, Howard L. Lubert, editors (Indianapolis: Hackett Publishing Company, 2007), Vol. II, p. 228. 4. George Bancroft, History of the United States, From the Discovery of the American Continent (Boston: Little, Brown and Company, 1866), Vol. IX, p. 492. 6. M. Mallet Du Pan, Considerations on the Nature of the French Revolution, and on the Causes which Prolong its Duration Translated from the French (London: J. Owen, 1793), p. 31. 7. The original reads: “Francklin répéta plus d’une fois à ses éleves de Paris, que celui qui transporteroit dans l’état politique les principes du christianisme primitif, changeroit la face de la société.” Jacques Mallet du Pan, Considerations Sur La Nature De La Révolution De France (Londres: Chez Emm. Flon, 1793), 28. 8. See, for example, Stephen McDowell, America’s Providential History (Charlottesville, VA: Providence Foundation, 1989), p. 178; John Vernon McGee, Thru the Bible (Nashville, TN: Thomas Nelson, 1991; originally printed in 1975), no page number; Dag Heward-Mills, BASIC Theology (Florida: Xulon Press, 2011), p. 29. 9. Homage of Eminent Persons to The Book, Samuel W. Bailey, editor (New York: Rand, Avery, & Frye, 1869), p. 67. 10. See, for example, Joseph Banvard, Daniel Webster: His Life and Public Services (Chicago: The Werner Co, 1895), pp. 131-132. 11. Daniel Webster, The Writings and Speeches of Daniel Webster Hitherto Uncollected (Boston: Little, Brown, & Company, 1903), Vol. IV, pp. 656-657, to Professor Pease on June 15, 1852; originally appearing in The National Magazine: Devoted to Literature, Art, and Religion. July to December, 1858, James Floy, editor (New York: Carolton & Porter, 1858), Vol. XIII, August, 1858, pp. 178-179. 12. See, for example, Stephen McDowell, America’s Providential History (Charlottesville, VA: Providence Foundation, 1989), p. 146; William Federer, America’s God and Country: Encyclopedia of Quotations (Coppell, TX: Fame Publishing, Inc., 1994), p. 18; William Federer, Treasury of Presidential Quotes (St. Louis, MO: Amerisearch, 2004), p. 459; D. James Kennedy and Jerry Newcombe, How Would Jesus Vote? A Christian Perspective on the Issues (New York: Random House, 2010), p. 28. 13. John Wingate Thornton, The Pulpit of the American Revolution (Boston: Gould And Lincoln, 1860), p. xxix. 14. John Quincy Adams, An Oration Delivered Before the Inhabitants of the Town of Newburyport, at Their Request, on the Sixty-first Anniversary of the Declaration of Independence, July 4th, 1837 (Newburyport: Charles Whipple, 1837), pp. 5-6. 15. See, for example, Stephen McDowell, America’s Providential History (Charlottesville, VA: Providence Foundation, 1989), p. 178; William Federer, America’s God and Country: Encyclopedia of Quotations (Coppell, TX: Fame Publishing, Inc., 1994), p. 72; Joseph P. Hester, Ten Commandments: A Handbook of Religious, Legal and Social Issues (Jefferson, NC: McFarland & Company, 2002), p. 138l. 16. For example, “These, and many other matters which might be noticed, add a volume of unofficial declarations to the mass of organic utterances that this is a Christian nation.” Church of the Holy Trinity v. United States, 143 U. S. 457, 471 (1892). 17. Justice David J. Brewer, author of the 1892 Holy Trinity opinion, wrote a 1905 book, The United States: A Christian Nation. Brewer opened his work with these words: “This republic [the United States] is classified among the Christian nations of the world. It was so formally declared by the Supreme Court of the United States. . . . Nevertheless, we constantly speak of this republic as a Christian nation – in fact, as the leading Christian nation of the world.” David J. Brewer, The United States A Christian Nation (Philadelphia: John C. Winston Company, 1905), pp. 11-12. 18. Richmond v. Moore, 107 Ill. 429, 1883 WL 10319 (Ill.), 47 Am.Rep. 445 (Ill. 1883). 19. See, for example, Stephen McDowell, America’s Providential History (Charlottesville, VA: Providence Foundation, 1989), p. 179; Stephen McDowell and Mark Beliles, Liberating the Nations: Biblical Principles of Government, Education, Economics, & Politics (Charlottesville, VA: Providence Foundation, 1995), p. 14; William Federer, America’s God and Country: Encyclopedia of Quotations (Coppell, TX: Fame Publishing, Inc., 1994), p. 23; Peter Marshall and David B. Manuel, Jr., The Light and the Glory: 1492-1793 (Grand Rapids, MI: Fleming H. Revell, 1977; revised 2009), p. 11; Ira Stoll, Samuel Adams: A Life (New York: Simon and Schuster, 2008), p. 203. 20. Samuel Adams, The Writings of Samuel Adams, Harry Alonzo Cushing, editor (New York: G. P. Putnam’s Sons, 1905), Vol. IV, p. 124, to James Warren on February 12, 1779. 21. See, for example, William J. Federer, America’s God and Country: Encyclopedia of Quotations (Coppell, TX: Fame Publishing Inc., 1994), p. 660; Henry H. Halley, Halley’s Bible Handbook (Grand Rapids: Zondervan, 2008; originally printed 1927), p. 18, “Notable Sayings About the Bible”; Martin H. Manser, Westminster Collection of Christian Quotations (Westminster: John Knox Press, 2001) p. 152. 22. See, for example, Howard H. Russell, A Lawyer’s Examination of the Bible (New York: Fleming H. Revell, 1893), p. 40, The Bible in New York. A Quarterly Review of the New York Bible Society (New York: November 1910), Vol. III, No. 9, p. 8, “What Some Men Have Said About the Bible,” Samuel Strahl Lappin, The Training of the Church: A Series of Thirty-Five Lessons Designed to Aid Those Who Would Know More, Do More and Be More in the Services of Jesus Christ (Cincinnati: Standard Publishing Company, 1911), p. 26, The Bible Champion, Jay Benson Hamilton, editor (New York: Bible League of North America, 1914), Vol. XVII, No. 2, February 1914, p. 85, Thomas M. Iden, The Upper Room Bulleton: 1920-1921 (Ann Arbor, MI: Ann Arbor Press, 1921), Vol. VII, No. 3, October 23, 1920, p. 35,”United States Presidents and the Bible,” John Calvin Leonard, Herald and Presbyter (Cincinnati: 1921), Vol. XCII, No. 38, September 21, 1921, p. 3. 23. James K. Paulding, A Life of Washington (New York: Harper & Brothers, 1835), Vol. II, p. 209. 24. George Washington, The Writings of George Washington, John C. Fitzpatrick, editor (Washington, D. C.: U. S. Government Printing Office, 1940), Vol. 37, p. 484, to Burwell Bassett, August 28, 1762. 25. George Washington, The Writings of George Washington, John C. Fitzpatrick, editor (Washington, D. C.: U. S. Government Printing Office, 1934), Vol. 11, pp. 342-343, General Orders of May 2, 1778. 26. George Washington, The Writings of George Washington, John C. Fitzpatrick, editor (Washington, D. C.: U. S. Government Printing Office, 1939), Vol. 30, p. 432 n., from his address to the Synod of the Dutch Reformed Church in North America in October, 1789. 27. George Washington, Address of George Washington, President of the United States . . . Preparatory to His Declination (Baltimore: George and Henry S. Keatinge, 1796), pp. 22-23. 28. See, for example, Stephen McDowell, America’s Providential History (Charlottesville, VA: Providence Foundation, 1989), p. 184; William Federer, America’s God and Country: Encyclopedia of Quotations (Coppell, TX: Fame Publishing, Inc., 1994), p. 289; Joseph P. Hester, The Ten Commandments: A Handbook of Religious, Legal and Social Issues (NC: McFarland & Company, Inc., 2003), p. 137; Newt Gingrich, Vince Haley, A Nation Like No Other: Why American Exceptionalism Matters (Houston: Regency Publishing, 2011), p. 76. 29. See, for example, information at Snopes.com. 30. S. G. Arnold, The Life of Patrick Henry (Auburn: Miller, Orton & Mulligan, 1854), p. 250, to his daughter Betsy on August 20, 1796. 31. Patrick Henry, Life, Correspondence and Speeches, William Wirt Henry, editor (New York: Charles Scribner’s Sons, 1891), Vol. II, p. 490. 32. Patrick Henry, Life, Correspondence and Speeches, William Wirt Henry, editor (New York: Charles Scribner’s Sons, 1891), Vol. II, p. 621. 33. S. G. Arnold, The Life of Patrick Henry of Virginia (Auburn and Buffalo: Miller, Orton and Mulligan, 1854), p. 250, to his daughter Betsy on August 20, 1796. 34. George Morgan, The True Patrick Henry (Philadelphia: J. B. Lippincott Company, 1907), p. 366 n. See also, Bishop William Meade, Old Churches, Ministers, and Families of Virginia (Philadelphia: J. B. Lippincott Company, 1857), Vol. II, p. 12. 35. Patrick Henry, Patrick Henry: Life, Correspondence and Speeches, William Wirt Henry, editor (New York: Charles Scribner’s Sons, 1891), Vol. I, pp. 81-82, from a handwritten endorsement on the back of the paper containing the resolutions of the Virginia Assembly in 1765 concerning the Stamp Act. 36. From a copy of Henry’s Last Will and Testament, dated November 20, 1798, obtained from Patrick Henry Memorial Foundation, Red Hill, Brookneal, VA.
37. See, for example, Harold K. Lane, Liberty! Cry Liberty! (Boston: Lamb and Lamb Tractarian Society, 1939), pp. 32-33; Frederick Nyneyer, First Principles in Morality and Economics: Neighborly Love and Ricardo’s Law of Association (South Holland; Libertarian Press, 1958), p. 31; Rus Walton, Biblical Principles of Importance to Godly Christians (New Hampshire: Plymouth Rock Foundation, 1984), p. 361; Stephen McDowell and Mark Beliles, Principles for the Reformation of the Nations (Charlottesville: Providence Press, 1988), p. 102; Stephen McDowell and Mark Beliles, The Spirit of the Constitution (Charlottesville: Providence Press, n.d.); Stephen McDowell and Mark Beliles, America’s Providential History (Charlottesville: Providence Press, 1989), pp. 263-264; William Federer, America’s God and Country: Encyclopedia of Quotations (Coppell, TX: Fame Publishing, Inc., 1994), p. 411; Gary DeMar, God and Government: A Biblical and Historical Study (Atlanta: American Vision Press, 1982), Vol. 1, pp. 137-138. 38. Alexander Hamilton, John Jay, and James Madison, The Federalist, on the New Constitution Written in 1788 (Philadelphia: Benjamin Warner, 1818), pp. 203-204, James Madison, Number 39. 39. James Madison, A Memorial and Remonstrance, on the Religious Rights of Man; Written in 1784-5, At the Request of the Religious Society of Baptists in Virginia (Washington City: S. C Ustick, 1828), pp. 5-6. 40. Religion and Politics in the Early Republic: Jasper Adams and the Church-State Debate, Daniel L. Dreisbach, editor (Kentucky: University Press of Kentucky, 1996), p. 117, letter from James Madison, September, 1833. 41. James Madison, “The James Madison Papers,” Library of Congress, to Rev. Frederick Beasley on November 20, 1825.